This amazing and luxurious oil works to aid the appearance of damaged and frizzy hair. 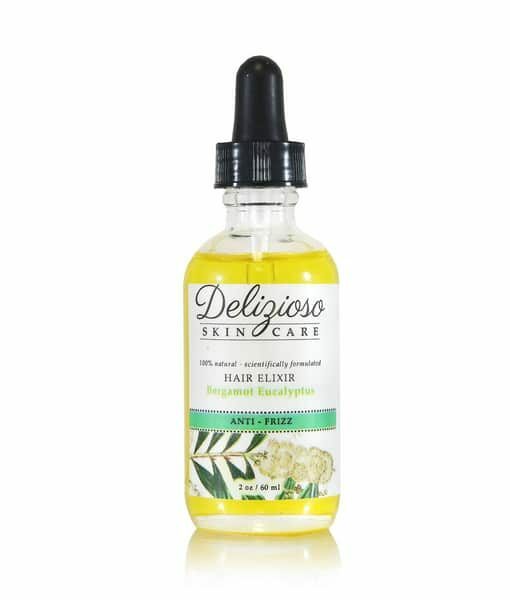 The silky formula richly nourishes all hair types and can be used as a hot oil treatment. Squalene (extracted from olives) is known to help strengthen and nourish the hair while Bergamot and Eucalyptus revive the senses. Hair types prone to frizziness. Experience an outstanding hot oil treatment by applying product to wet hair, add heat for 30 minutes, then wash out. Or apply to dry hair to style. Product Size/Weight: 2 oz / 59 ml – or Travelsize 0.5 oz / 15 ml. The scent: Bergamot citrus with Eucalyptus hints. *Olea europaea (Olive) Fruit Oil, *Argania spinosa (Argan) Oil, Oenothera biennis (Evening Primrose) Oil, Pro Vitamin B5, Azadirachtin indica (Neem) Oil, Eucalyptus globulus (Eucalyptus) Oil, Citrus bergamia (Bergamot) Oil. EUCALYPTUS OIL: Eucalyptus oil is a great multi-use oil for hair, including strengthening the hair follicles, improving the shine and overall health of the hair, and calming an itchy, inflamed scalp. The oil also has a number of antifungal properties that can help ward off infection and keep residue from building up and clogging pores on the head. NEEM OIL: Neem oil is the cocoa butter or shea butter of the east, high in Vitamin E, rich fatty acids, soothing dry, cracked or otherwise damaged skin. Unlike petroleum moisturizers, neem restores the skin’s natural elasticity. ( * = Certified Organic ) *Olea europaea (Olive) Fruit Oil, *Argania spinosa (Argan) Oil, Oenothera biennis (Evening Primrose) Oil, Pro Vitamin B5, Azadirachtin indica (Neem) Oil, Eucalyptus globulus (Eucalyptus) Oil, Citrus bergamia (Bergamot) Oil. Honestly I really do like this product, even though I haven’t tried the hot oil treatment yet (Waiting for my next hair washing day). The only reason I gave it four stars instead of five is because I didn’t like the smell as much as the Orange Blossom Hair Elixir, but that doesn’t degrade the quality of this product in the slightest. I’ve used it on my hair when it’s dry and I did notice that the frizz went down significantly. I’m just picky with scents.